Later they ran a tobacconist and greengrocers shop which my Mum managed. It was 17 East St., at the bottom of Stapledon Lane. They moved into the London Hotel in West Street in 1940, where he and Granny housed American Army Officers on the top floor during the 40's. My brother was born at The London Hotel and as well as me and my Mother. Russell and Rose Martin also lived there. Russell Martin was in the Navy during the WW2 and survived, I think it was 3 times, being blown up by German submarines. In 1949 Granny and Grandpa bought 'The Rising Sun' at Woodland, after a few years there, they retired to a cottage in Ashburton: 'Sunnywaye' 18 Back Lane. Grandpa was always buying cottages, doing them up and selling them off. One cottage that he and Mum bought was up the top of West Street in the 50's. The walls were so lumpy and bumpy that Mum covered them all with amazing floral wallpaper, when she came to sell it she put in bits and pieces of furniture plus an antique Grandfather clock. The cottage sold for £1,200, but the clock alone was worth far more! Oops! He also owned lots of cottages in Back Lane which he rented out to family and friends: he was also instrumental in changing the name of Back Lane to Stapledon Lane, so named after the Bishop Walter de Stapledon. My mother went to the Ashburton Grammar School in St. Lawrence Lane. When Mum was in her last year at the Grammar School, she and her class mates were made to mark the homework of the younger children: Mum used to moan about lazy teachers! She also belonged to Ashburton's Amateur Dramatics theatre run by a Moyra Babington and was for several years in a row, the Carnival Queen's attendant. My Mother and Uncle Russell, who was a gifted musician, used to play in the Pub Bars to entertain the customers and to earn some money. Mum also played piano at the local Cinema to accompany the black and white silent movies. In 1952 we lived at No.12 North Street but Mum never opened the shop and we soon moved out and went to live up at The Hollies, Holne Cross. 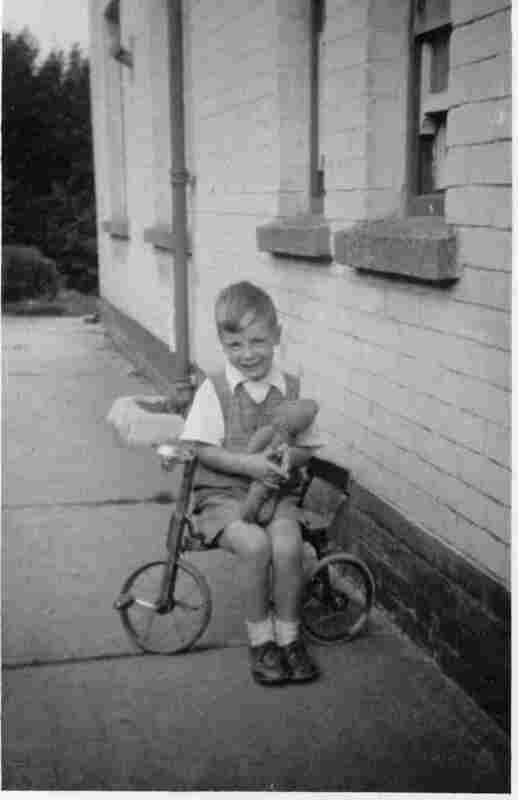 My brother and I used to free wheel our bikes down Lent Hill with our legs outstretched to the side and screaming our heads off (no traffic around in those days): how we didn't break our necks at the bottom of the hill I'll never know, bells worked, brakes didn't. We also used to wander up over the moors and went up to Cold East and sat on the Ten Commandment Stones. Freedom was ours and we had no fear of being molested more likely to have got a smack round the ears and told to go home. We were only 8 and 13 years old then, and 13 in those days was nothing like a 13 yr. old today! We were innocents abroad. She didn't catch us, gave up and went back indoors, BUT several days later, out of nowhere, she hit us both hard across the face. Crying and rubbing our sore cheeks, I said, 'What's that for?' She bent down, glowering at us and said one word - 'Gooseberries'. Up the top of this garden Grandpa had an orchard, part of which was a chicken run. Granny had given us some old net curtains to play with and my brother and I fixed them up in the trees to make a kind of tent, and we played cowboys and indians with the chickens - we were the cowboys ! We would sit quietly in the trees, and when the chickens were all out of the coop we would jump down and chase them round and round till they all ran back to the coop, clucking like mad. Next day Grandpa would be complaining to Granny that he couldn't understand why his chickens weren't laying! 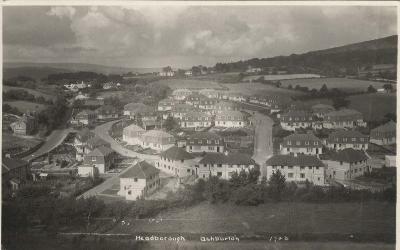 Right: The family later moved to 26 Higher Roborough. 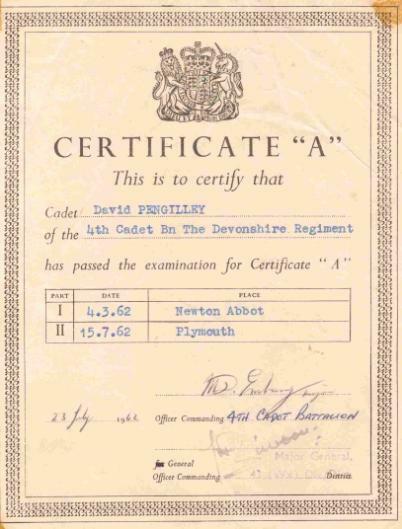 David George Pengilley was born at 6a North Street, in July 1948. 6a was surely the cottage (now demolished) behind No. 6 North St., accessed by a passage to the right of the shop. His father, George, was a forestry worker. 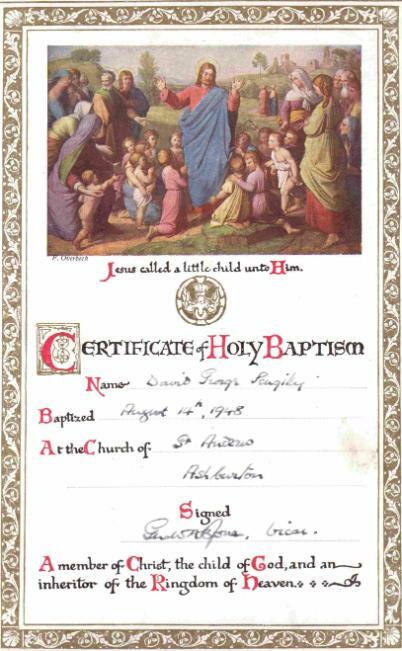 He was baptised in August of the same year. The vicar, Gerald A B Jones, signed the certificate. 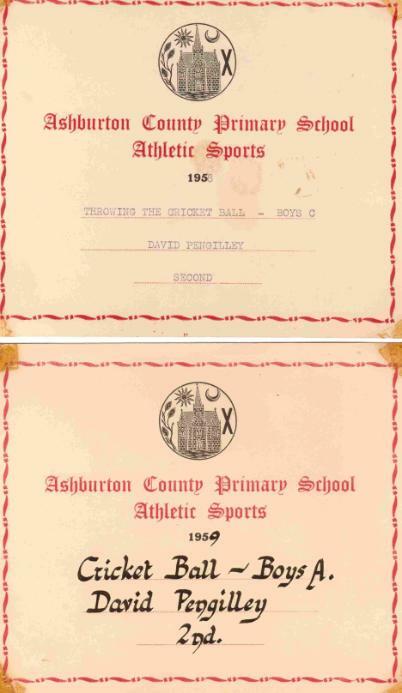 David attended the Elementary School, which became Ashburton County Primary School in 1958, when a separate Secondary School was opened at Balland Lane. 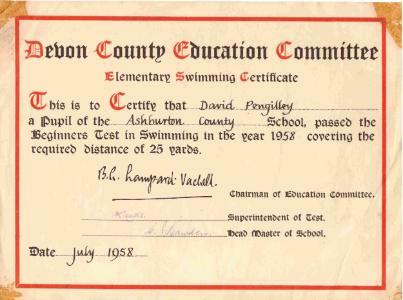 C J Bawden was headmaster at this time. 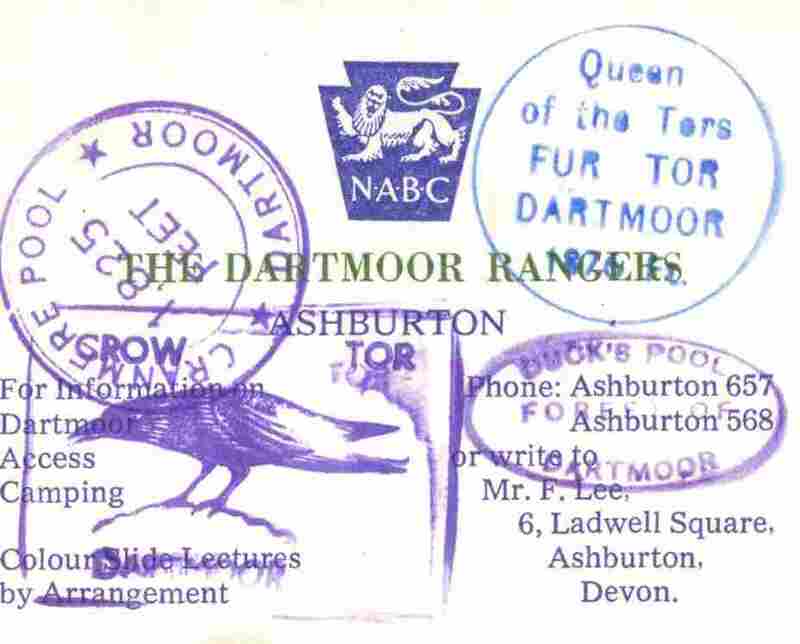 The South Devon Journal in September 1963 reported that six members of the Dartmoor Rangers' boys' youth club had crossed Dartmoor from north to south in the dead of night. Their leader was Frank Lee, and together with his alsation, Simon, the team left Okehampton at 9.30pm 'with only the help of a compass'. The boys were: Alan Boon, Clive McDonald, John Brixey, Graham Monnington, David Pengilley and Lesley Grigg. 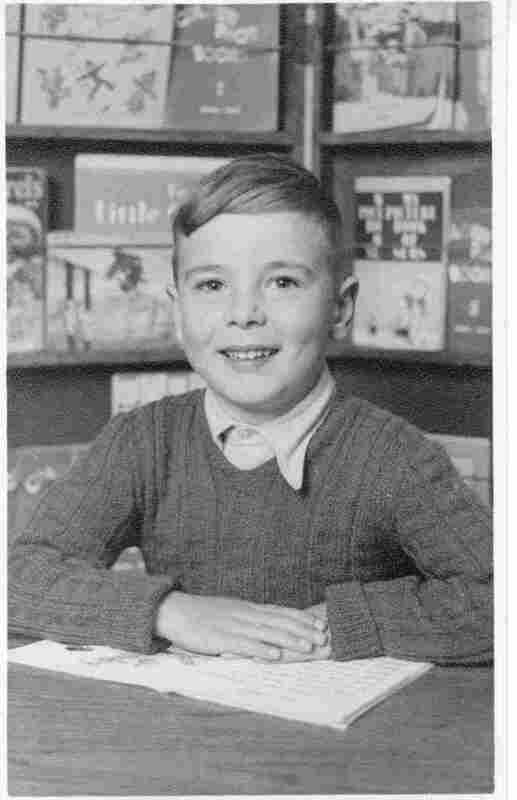 I was born in 1950 in North Street, just two doors up from what was then a fish and chip shop; my mother knew never to hang washing out when they were frying! We were situated right across the road from the Town Hall which was very convenient as my mother (Margery Morris) worked there throughout the years I lived in Ashburton. Like the rest of Britain, in the early fifties, the town was still adjusting to peace time from the austerity of the War. Sugar then was coveted, not seen as something to avoid! 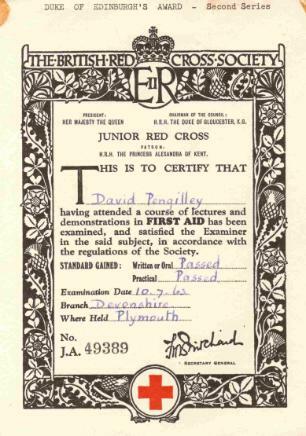 In spite of its proximity to the bombing of Plymouth, I seem to remember being told that only an orphanage at Hele was affected. As children we would dare each other to venture inside the shell of the empty building, believing it to be haunted - we were unconvinced by reports that the stray bomb fell on the very day the children were all away on an outing! 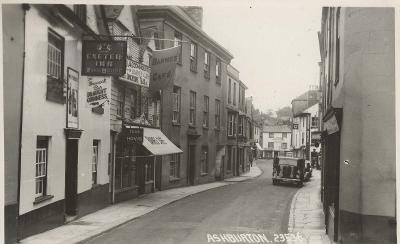 The Ashburton I remember from the 1950s was a well ordered town. Although still boasting many original and historic structures, new houses were again being built: Westabrook Estate was looking very fresh. There were well-meaning souls who organised events and enthusiastically arranged entertainments. Despite being away at school for more of the time, my childhood seemed to be a succession of harvest festivals (of all denominations), jumble sales, fetes, coach outings with one group or another, Girl Guides, horse riding, and of course the carnivals. The town seemed peopled with colourful characters. Captain Hook in Peter Pan held no fears for me after I witnessed round faced Fred Wills, the Town Crier, frequently exchange his prosthetic gloved hand for the sinister hook he wore every day. I can still hear his voice proclaiming coming events as he stood by the Bull Ring, and feel the cold metal against my cheek in a cheery greeting. Although merely a granite monument marking a piped water supply to the town in 1867, the Bull Ring served as a hub - and later a traffic obstacle - but I still bemoaned its destruction in the 1960s. Although the bulls were long gone from the town centre, I recall moments of terror when faced with excitable cattle being herded down the streets to the market at the end of St Lawrence Lane. In autumn it was Dartmoor ponies which skitted down the paved roads to the market. 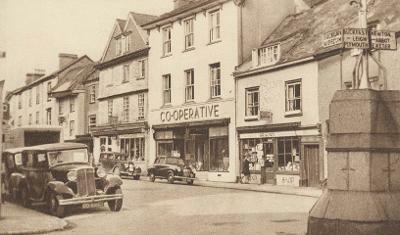 Above: North Street showing the Co-op and the Bull Ring. In the post-War optimism and prosperity, the shops in the town always seemed busy. The Wool Shop at the bottom of West Street sold not only wool, but displayed elegant dresses with full skirts that defied former austerity. Elegant wives, gloved and hatted, carried baskets of provisions, stopping to greet or exchange gossip with others. 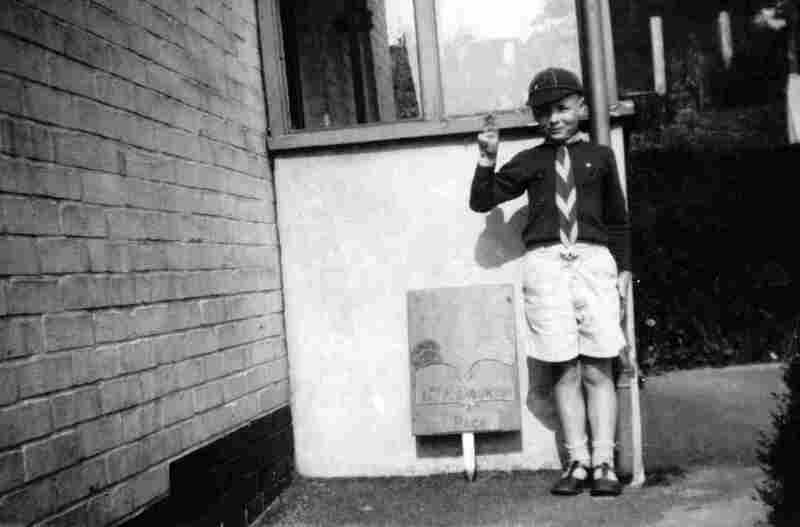 As a child, it was me who had to step off the pavement to negotiate a route around them. However there was little traffic until the 1960s. Sid Baker's British Rail lorry often had North Street to himself when he delivered fresh fish next door! Not far from the Wool Shop was Holman Ham the chemist, with those amazing tulip shaped coloured glass containers in the window. The compensation for being ill was when my mother bought Lucozade in its bright yellow cellophane wrapping from the chemist. Next came Mann's, the electric shop, offering all the latest household gadgets. As a young teenager I bought my first transistor radio from there. Among the shops was Owen's the bakers, at the bottom of East Street, and Barnes, also Bakers, were situated opposite the church; and there was Frisby's the shoe shop, Cubitt's for haberdashery and linens, Church's the hardware store, and Tom Lang, the butchers where I was sent each Saturday morning for the family meat. Above: West Street showing the Exeter Inn and Barnes Café. Saddler Eales, next to Lloyds' Bank, was a dark and very dusty shop smelling of leather and oils. Mr Eales, seemingly always ancient, like a figure from a Harry Potter story, would perch on a stool at the rear of the shop and saying very little would grudgingly part with his beloved goods. Anyone with an interest in horses will remember him well - similarly the blacksmith's shop in St Lawrence Lane. I recall a cinema off North Street made a brief appearance in my life. I was dragged there once by my older sister to see some horror film and had nightmares for weeks! However I associate the little Barn Theatre set back, half way up West Street, with humour. The Buckfast players entertained us there; Mrs Hurley their leading lady seemed so glamorous and fashionable. I must have been four when a Medieval Market was held in the old pannier market at the back of the Town Hall. It must have gone on for several days, and my mother's contribution was a stall making griddle scones. We found the rusted cast iron griddle when we cleared my parents' house in 1995. She always claimed that she and her helpers must have made hundreds of scones during the festival. I was scared by the jester even though I knew it to be 'Uncle' Robert Garner dressed up. I was just tall enough to look over the counter of the International Stores when it first opened in East Street, and later moved to the Card House in North Street. I saw treasured sugar poured into blue bags and chunks of freshly cut butter or cheese wrapped in greaseproof paper, biscuits kept in stacked boxes with lids that lifted. Yet the best delight of all was to watch the change canister whizz across the Ashburton Co-operative Store in North Street, on its track to the severe looking lady sitting high up in her glass box. It was a Saturday treat to catch the train from the station and journey to Totnes. The playground on the hill had a long rocking horse I loved. Bill Cartwright was the engine driver and he would let me jump on the footplate when in the station. There was that smell of hot metal and the oily feel of the cold metal handle as I was hoisted up. Changes came as I became a teenager. Some stores moved premises, others closed. The sweet shop run by the dear Misses Butler closed down. The railway stopped running in the Sixties; I sadly missed the last train. The market ceased. The street lights changed from gaslights to electricity. Traffic constantly began to clog up North Street, so the buildings behind the Town Hall were demolished to create a carpark. The by-pass was extended from the single carriageway I knew as a child to the dual carriageway of nowadays. The Police and Fire stations moved from their town locations to new premises in Eastern Road. 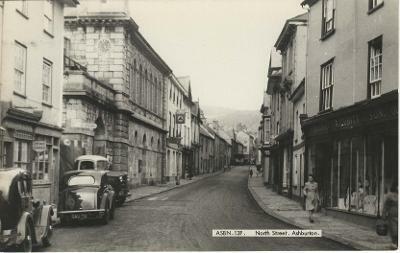 Above: North Street showing Town Hall. However, not all the changes were to be regretted. Flood defences at Great Bridge put a stop to the regular flooding down North Street. I clearly remember one occasion when the river water swirled down the street, to eddy around the Bull Ring and seep into Lloyds' Bank cellar. Our house had slots either side of the front door to hold the heavy flood boards which were hastily put in place whenever there was heavy rain. It was well into the Eighties before my father finally moved the collection of sandbags that stood by at the ready! However, one thing has remained constant through many years - the ale tasting! In the 1800s Ashburton had a proliferation of public houses, and there were still over a dozen when I found myself carrying the sprigs of ivy to be presented to the town's landlords during the procession around the town. As the Town Clerk, it fell to my mother to act as Steward to the Court Leet and Baron Jury, and so take part in the annual ceremonies held in St Lawrence Chapel when the pig drovers, bread weighers, ale tasters and others were appointed. I left Devon in 1971, when I married, to travel the world. Yet, although I settled happily in Warwickshire, near Alcester, one of the few other towns to boast a High Bailiff (similar to a Portreeve), a part of my heart has remained in Ashburton. I have returned regularly and seen it change, and yet not change - it still seems to be a town which nurtures a real parochial spirit, perpetuating the same sense of community that was so active in the fifties and into the sixties. Many thanks to Rachel for this account; also to Judy Marshall of Around Ashburton for giving me permission to reproduce the article.